Tell me if this sounds familiar. You have an important meeting or a school project that is due tomorrow. As you’re checking through everything and putting on the final touches you realize you’ve done something wrong. This something being redone will take you forever to fix and it’s already late. You start thinking about how ridiculous this whole situation is until finally, it happens. Those criticisms of the situation become criticisms about you. “You’re such an idiot! Why didn’t you check this before you started?” or comments like this are lambasted at you. It’s like a punishment you feel you deserve for not doing it right the first time. While it might seem warranted, you soon realize the effects. You feel like nothing you do is good enough and begin to doubt your own ability to correct the issue. Familiar, isn’t it? Destructive self-criticism is a dangerous tool. It robs you of your self-confidence and can affect your ability to set healthy and attainable goals. It’s a vicious cycle too. To overcompensate for failing the last time you set a higher and even more difficult goal to achieve only to let yourself down again. But life doesn’t have to be this cycle of destructive self-criticism. Take your power back with these 3 tips to overcome destructive self-criticism. The biggest step to take is to recognize you’re not alone. It may seem trivial but think about it. When you feel like you’re the only one going through something you tend to isolate yourself. Isolating yourself with destructive self-critical thoughts can lead to anxiety or low self-esteem. Once you realize you’re not alone, you are better able to understand what you’re going through and how to overcome it. The New York Times did an in-depth interview with several psychological researchers about self-criticism and came to some eye-opening conclusions. Evolutionary psychologists have studied negativity bias and have concluded we evolved to give more weight to our flaws, mistakes and shortcomings than our successes. So you can rest assured with the fact that not only are you the only one but it’s evolutionary. However, this doesn’t really fix things. It just ensures we’re not alone. Much like it benefits us to know we aren’t the only ones, it also benefits us to have more knowledge on what we’re about to face. Self-criticism does more than damage our self-confidence, but it can destroy our bodies. Dr. Richard Davidson, the founder and director of the Center for Healthy Minds at the University of Wisconsin-Madison, explained self-criticism in more depth. To summarize, self-criticism can affect our body and mind by essentially making us mentally and physically ill. But on top of that, we have a mechanism in our brain that is responsible. It sounds like a situation of “Damned if you do. Damned if you don’t” but there is a way to get our brains out of that catch 22 it finds itself in when it comes to self-criticism. Make the choice you’ll try a new approach to thinking about yourself. In fact, you’ll go easier on yourself. Dr. Brewer suggests any type of practice that helps us stay in the moment and notice what it feels like to get caught up. This way we see how painful that is compared to being kind to ourselves. An excellent choice of exercise is mindfulness meditation, a type of meditation, which involves anchoring your attention on the breath as a tool to stay present without getting lost in judgements, stories and assumptions. Meet your criticism with kindness. If your inner critic says, “You’re lazy and worthless,” remind yourself by saying, “You’re doing your best”. These little reminders go a long way in helping you realize your true potential and reduce self-criticism. Even showing a bit of gratitude can have wonders on your mental state. Make a deliberate, conscious effort to recognize the difference between how you feel when caught up in self-criticism, and how you feel when you can let go of it. Dr. Brewer says that’s when you hack the reward-based learning system. Because our brains are always looking for the bigger, better offer, of course, our brain is going to favor the decision to not be constantly berated over the latter. 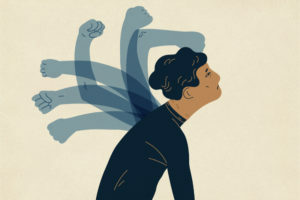 Practicing these tips to overcoming destructive self-criticism is a necessary component to self-care. If can truly help open our eyes to our potential once we accept our faults and show ourselves self-compassion. As one of the leading Carrollton Therapy Centers, Lifeworks offers the help of several experienced psychologists to assist you in overcoming destructive self-criticism. Get connected with a psychologist today.